I stumbled upon this video by Vincent Floderer demonstrating how to fold his mushroom. While you might argue whether it's still origami or not, it is definitely an interesting technique. I'll avoid the discussion by simply calling it "crumpling". Anyone know what crumple means in Japanese? Google translate suggest: 揉む (crumpling) or 揉む紙 (crumpling paper). And that's the great thing about crumpling, I guess. Just use the paper you would have else thrown away - and it only takes 2 minutes to complete. what was the failed attempted model? also what is the hardest thing you have ever folded? I tried folding the Secretary Bird by Roman Diaz, but found the paper was just too big to work with comfortably. It's always hard to say which the hardest model is, but it should either be Satoshi Kamiya's ancient dragon, or Hung Cuong Nguyen's eagle. This mushroom looks great...I will be trying it out shortly....I hope mine comes out as good as yours. By the way, I thought I'd send you the link of another video (Vincent Floderer's design, again) on the 'crumpling technique' This one of of Vincent Floderer's sea urchin (I think!) and is folded or crumpled rather from a napkin! I tried to fold it, but I didn't have the appropriate paper. What is the paper called and where did you buy it? I used 28gsm Kraft paper, which is available at http://www.origami-s.... Vincent Flodderer uses butcher's paper, I think. 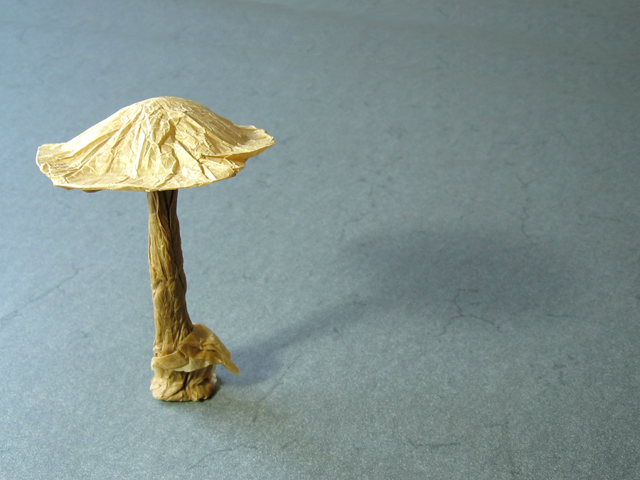 I thougt, I never could make this mushroom with normal paper. But now it should work. Hi!Could this model be folded by gift wrapping paper? Try baking paper instead. Paper napkins also work quite well, but you have to be extremely careful not to add too much water when forming the stem, and you probably need to stabilize it until it's fully dried. In my experience tissue paper works best. Burger wrappers also work well, although you have to get the grease off somehow. I'd try baking paper instead. I've also done this using paper napkins. It doesn't work as well, but it's a nice start. I don't think copy paper or kami will work, I fear. i also tryed copy last night... it was Way to thick! It is very hard to make mushrooms with copy paper, and the resultat is not very beautyfull. You should use thin paper (like napkins, paper hankie or tissue paper). So happy crumpling ! But I recommend to crumple it much longer before wetting it. The network on the "hat" of the mushroom would be better.